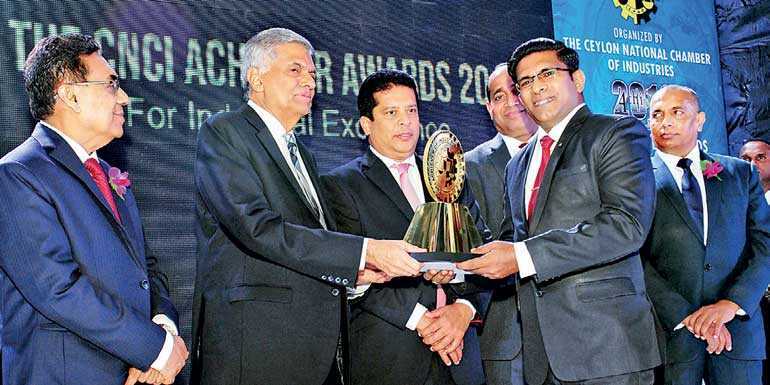 Balasooriya Private Hospital Chairman Priyanthalal Balasooriya received the Gold Award in National Level, Large Category, Service Sector at the CNCI Achievers Awards 2018 organised by the Ceylon National Chamber of Industries (CNCI) of Sri Lanka. Balasooriya received the prestigious Gold Award from Prime Minister Ranil Wickremesinghe at the Galadari Hotel. Balasooriya Private Hospital, registered as a private company in 2010 coming under the purview of the Board of Investment of Sri Lanka, is the leading hospital that is well-equipped with all the facilities of a private hospital in the North Western Province. Balasooriya Hospital has awarded by the Best Private Hospital for the North Western Province, North Western Province Business Excellence Award and FCCISL Entrepreneur Award, winner of the National Business Excellence Award 2017 for Healthcare Related sector. The hospital has received many accolades and has the distinction of being ISO 9001:2008, ISO 14001:2009 and ISO 18001:2007 international quality certificate. A 24 hour out-patient medical service is available together with specialist channelling service, patient consultation and laboratory services, air-conditioned and non-air-conditioned rooms, physiotherapy facilities, optical, ultra sound scanning, digital x-ray, echo testing, ECG, EEG, exercise ECG, mobile medical services, ambulance services, emergency medical care unit, spirometry test for lungs, audiometry, endoscopy and colonoscopy, LED lighting equipped modern operation theatres and delivery room.